By the time I got home to Oregon it was obvious that the injections I got in Bolivia were not winning the battle. I met with my travel doctor and brought the drugs I got from Bolivia: the bactrum pills I got at a pharmacy and the 4derm ointment and prescriptions for the injection from the doctor in La Paz. 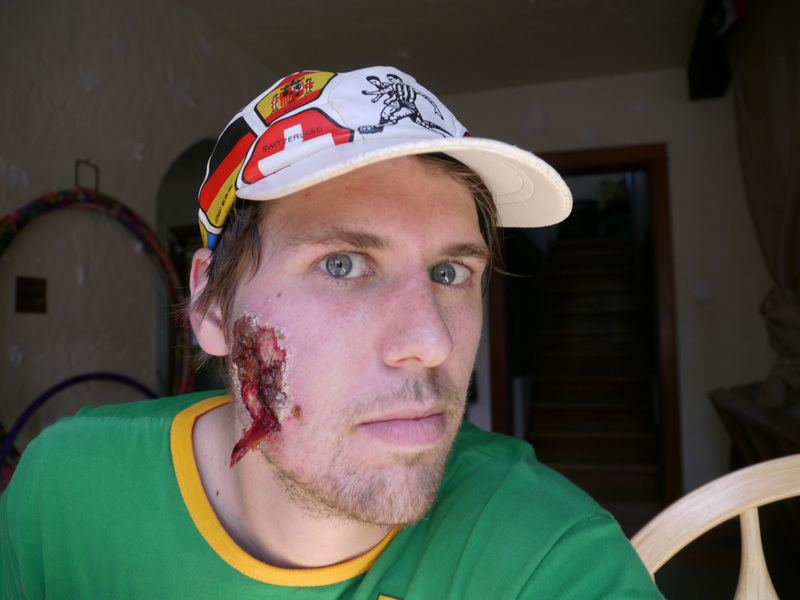 He described the injection as “a shotgun method anti-bacteria and anti-fungal.” He didn’t seem too concerned about the wound on my cheek and assured me he’d figure it out soon. At this time it was the size of a quarter with a crater in the middle and crusty, orange rim. My doctor simply took a swab of the viscous middle and said he’d wait a week for a sample to grow from the culture. He gave me a prescription for penicillin – which I was surprised, is still the best basic anti-biotic – and sent me home to wait. I continued visiting friends, looking for work, settling back in to life in the USA. A week later I called my doctor but he said the culture hadn’t grown anything yet. After a few more days I called again – no culture. My doctor wasn’t too worried, certainly not animated, so I tried to play it cool as well as to stubbornly contrast Shalynn’s growing impatience and my family’s general over-concern. 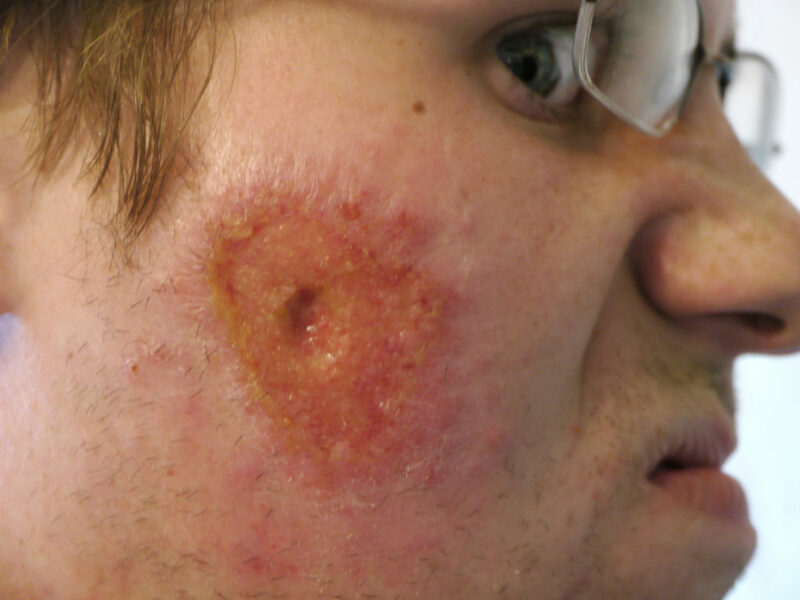 His best guess was that it was MRSA – a highly contagious skin bacteria that spreads on contact. It can be a nasty infection, some cases of which can only be cured by extricating the infected area. I hoped they wouldn’t have to cut my face off. When I called at the beginning of the next week and my doctor still had no results I urged him to take the next step and try a biopsy. Shalynn had grown more and more impatient with his apparent lack of concern and the fact that I had to call his office for each bit of news. She wanted me to see a specialist, but I was confident my doctor could figure it out if given a bit more time, but prodded him into going for the biopsy. The culture, he had said, would only reveal an organism if it was a fungus or bacteria. Since nothing grew, it must be something else, something only diagnosable under microscopic scrutiny. He was reluctant to cut into my skin but the wound was getting worse and he agreed that would be the next step. A biopsy is a simple procedure: he rubbed around the wound with an alcohol swab, stuck in a local injection of Novocane, then sliced a 3mm chunk from the topmost and furthest back corner of the wound. My mom came for support; watching her saddened face grimace was the hardest part of the procedure. The biopsy is daunting to think about and is painful, but quick. Wrapped in a pressure bandage to stop the bleeding, I went off with hopes of finally discovering what was causing the wound. My doctor sent off the sample of my flesh to a local lab and expected to find out within a week. In the meantime he came back to me with guesses as to what kind of infection I had. As I contemplated nicknames for the infection, another week passed and I didn’t hear a word from my doctor. Shalynn was now mad at me for not going to a specialist, and she was disgusted by my doctor. I called his office daily and didn’t get an answer for a few days, until a nurse called me to ask where I wanted to fill my prescription of Ciprofloxin. At this point I was really disappointed in my doctor. I couldn’t get a hold of him that day so I left angry sentiments with his receptionist and “Staphanie” and I went to the pharmacy to get our Ciprofloxin. My doctor called me the next day, tail between his legs, defeated. He apologized for the lack of communication. I asked him about the staph infection and the timeline and how it would heal and what the scar would be like – he didn’t know if it was a staph infection. I lost over three weeks of ground in the battle. Now the wound was crusted over like the cheesy roof of a casserole and the size of a decent forkful. I found a dermatologist and she happened to be Argentinian. She had a French name so I completely lucked out on that random fortune; her knowledge of the region’s micro-parasites made her take my affliction much more seriously. As soon as she saw me she was deeply concerned, took another biopsy, and had the sample tested for specific, difficult to detect micro-organisms. “Oh Leishmaniasis! Wow. Ok. Well that explains it.” It appeared that “Leishlie” and I had a long road to travel.